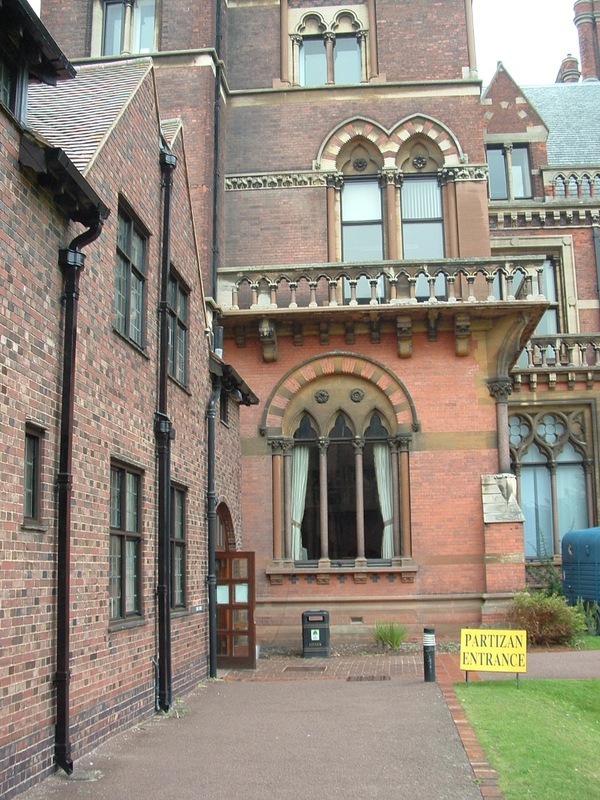 I went to a wargame convention yesterday called Partizan II at nearby Kelham Hall. 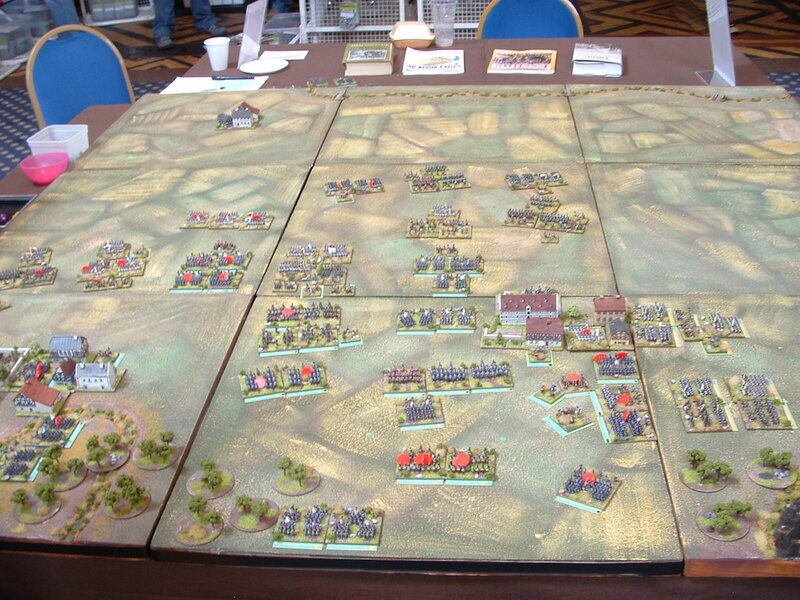 It’s a venerable old gent of the UK wargames calendar with many years under its belt, and at least 3 different events per year under different names and with differing foci. Partizan and Partizan II are historical, and Hammerhead mainly SF&F. This is the entrance to the show and illustrates a little of the rather grand building it’s held in. It seems that the architect was very fond of brick arches, and made sterling use of the 3 colours of brick that were evidently available at the time. I won’t bore you with lots of pictures of crowds; the following are to illustrate the splendid venue as much as the show itself. So what was on offer? 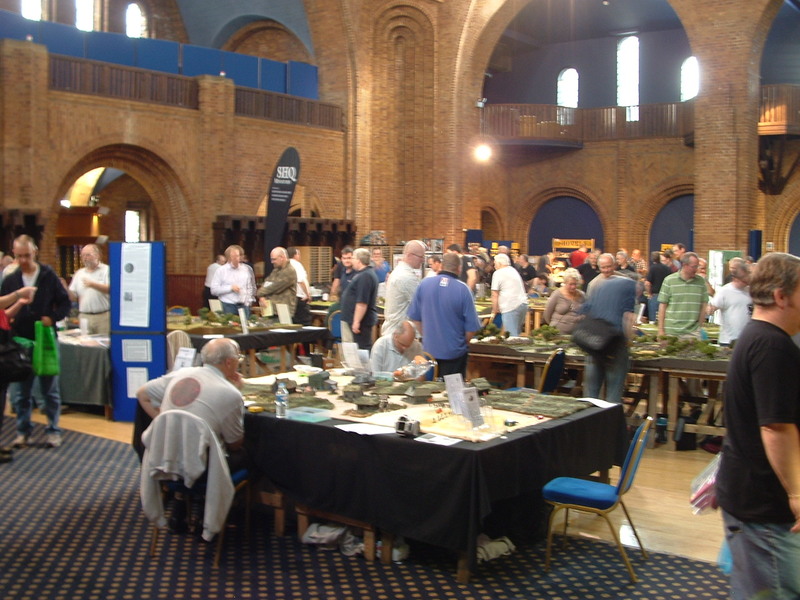 Well, the usual mix of demonstration and participation games as well as a load of traders with models, games, books and all manner of scenery, dice and other associated gubbins. 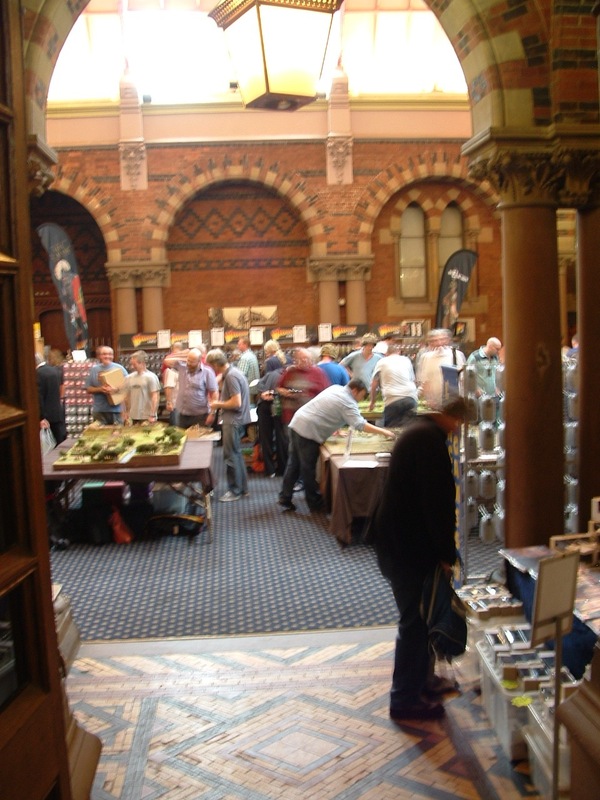 I didn’t take pictures of traders per se as you can see little but banners, and that’s dull. If you’re interested a full list is on the Partizan site. 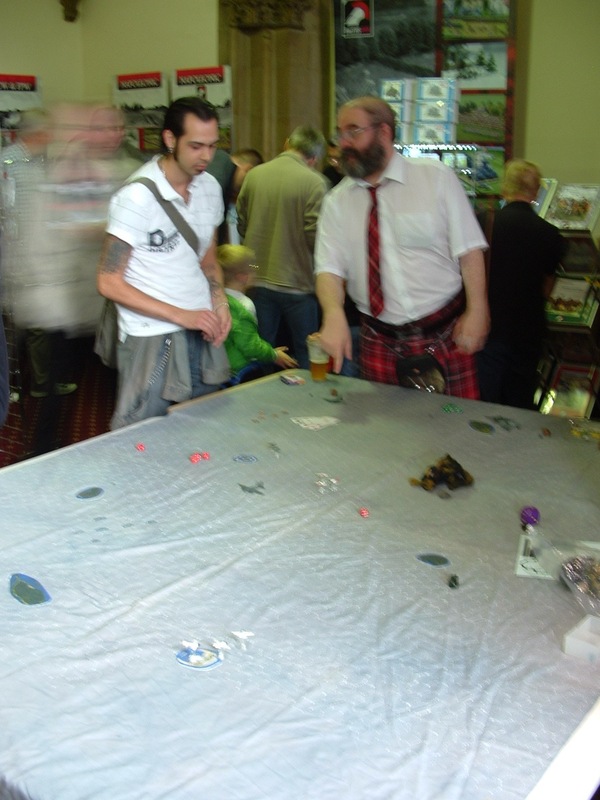 I did, however, take some photos of a few of the games that were on offer. The one that most caught my eye was a snowy WWII scrap. As you can see, this is a game of Rapid Fire, though I was just taken by the look of the thing. I have a real soft spot for nicely done snow battles. In the second pic you can see quite how unhappy the Americans are at this point. The wall of German armour is just off shot to the right. This picture shows the American forces with the “Ronson” at the right, doing what Ronsons do best. The grey plumes of a slightly overshot artillery strike on the left remind the advancing GIs that the open field they’re in could be a bad place to stop. Best keep going, eh? Second up we have a very different game, set in much sunnier times. Romans in various formations advance on a Celtic hill fort. Another very attractive table. The local centurion will have them on a charge though, as the tents haven’t got even the most basic palisade round them. Call that a marching camp! Changing tack rather, this is a tiny scale Napoleonic (I think) battle. I do like the overall look of the board as it reminds me of an aerial photograph, which I think is the right sort of reference point for this scale. You can’t really see it in the photo, but the river snaking along the far side was rather nicely made too. The only thing I thought spoiled this was the bright red tiddly winks used to mark casualties (or whatever) on the unit bases. They stand out more than I like and rather spoil the effect for me. 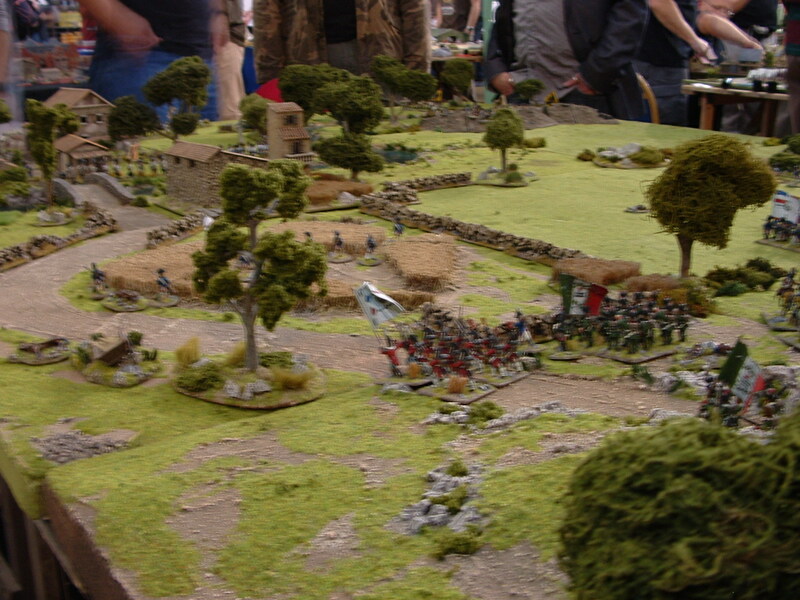 After the tiny we go back to 28mm scale, and a game with more lovely scenery (though a bit fuzzy, I’m afraid). 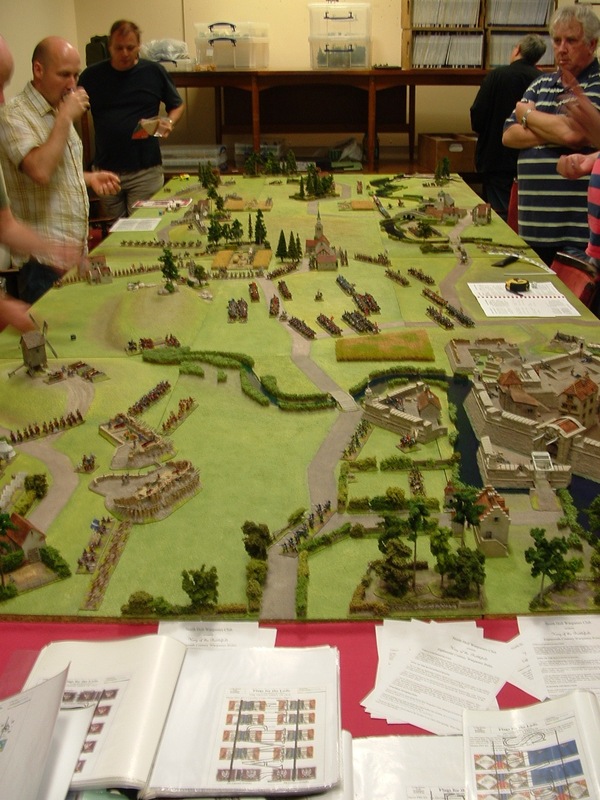 Looks like Napoleonic wars in the Peninsular to me – note the buildings at the back. 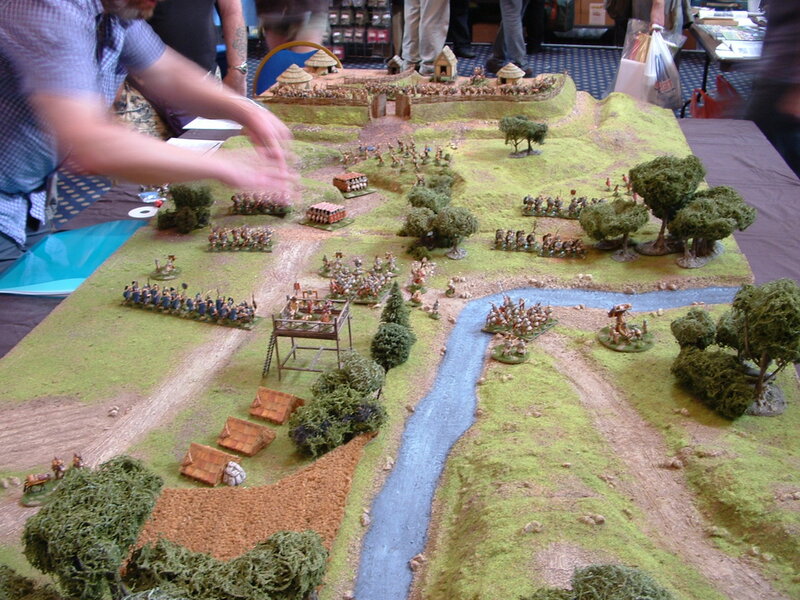 Smaller scale, bigger table and a grand sweep of battle below. The kind of thing I can’t do at home, but do feel inspired by (even if it might not actually be much fun to play). Finall, the participation games deserve a mention. There was one about Bricourt that my camera didn’t like, but which looked intriguing. As this action is used as an exemplary attack at West Point it would have been interesting to play, but time was against us. 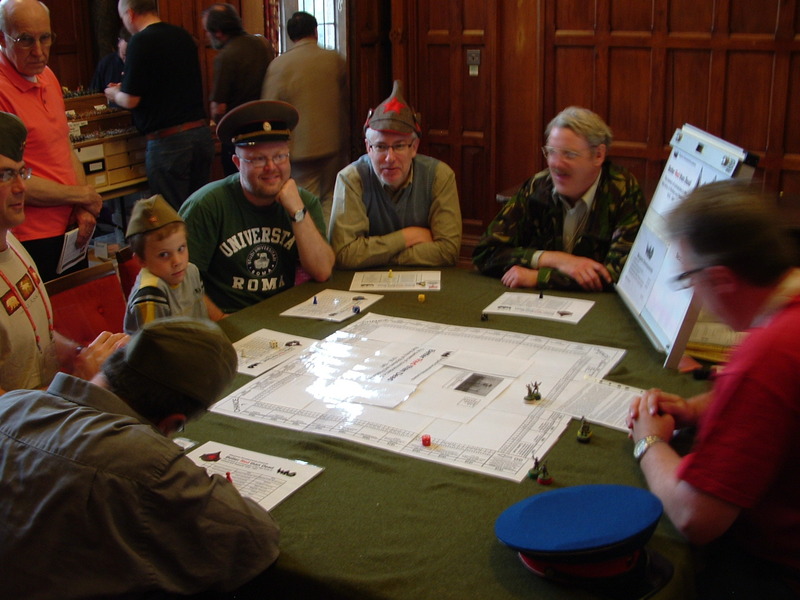 I also rather liked the idea of the Wargames Development game about WWII Soviet officers pictured below, though I didn’t play that either. Fatalities did seem exceptionally high here (which seemed to be a major point), but with NKVD in charge that was always going to be likely. What we did get to play was The Men From Del Monte. This was a brisk little game about the B17 missions flown by a squadron of American airmen who ended up flying out of the Del Monte pineapple plantation on Mindanao in the Philippines. It was a real Boy’s Own Adventure kind of story, and a fun little game that lasted only a few minutes. I managed to sneak in low and bomb the Japanese airfield from low altitude, dodging flak as I went and returned to the base with plenty of fuel to spare. It was lucky that I took the risk to bomb from low altitude and risk the flak as my dice rolls were so rubbish that I only just managed that, but manage I did. Bob took on the Japanese fleet instead and sank almost everything they had in the Pacific, though his plane came back with more bullet holes in and less fuel so I got to pretend I’d won even though it wasn’t competitive. An amusing little game, and though it isn’t something that I’d play regularly it was exactly the right sort of silly convention game that I personally think makes events worth going to in the first place. It was, incidentally, run by the Blues Bears, who I know little about and about whom can only find this. It’s a different game from the linked article, but certainly sounds like them. A fun pair. The photo below shows Bob (on the left with the ghost behind him) being told how badly pranged his B17 got when he was silly enough to let it get bounced by Zeros on the way to the fleet. Tsk, tsk. So did I buy anything? Silly question. To start with, as one of the first 500 through the door I got a free figure. 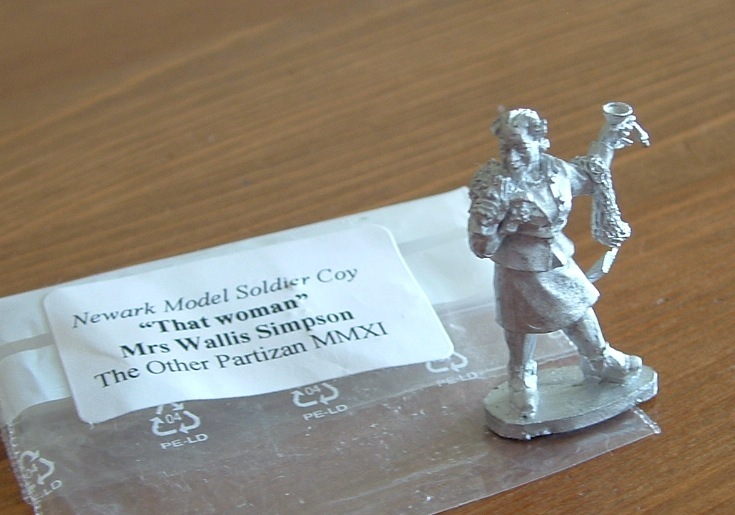 The Partizan shows usually give a model away, and it’s often a little random. This was no exception as it was Mrs Wallis Simpson. Apparently the earlier Partizan figure had been King Edward, but as I didn’t go I don’t have him. These are all from the nice chaps at the Plastic Soldier Company, who I’ve seen online before but never in the flesh. The models look very nice up close, and are a good price too. You will note my usual problem in WWII gaming in that I have 2 different scales here. A rather scatter-shot selection as I wanted to get a cross section to see what they were like rather than dive in to a single theatre. I’ll review them in due course if anyone’s interested. Helpfully, as well as writing on the boxes what scale they are, they seem to have the idiot-proof system of red for 1:7nd and black for 15mm. A cunning plan indeed. I think the next show I’m likely to be at is the Nationals at Derby, if we can find the place. Derby has the world’s worst road network and last time we went it took twice as long to find the event as it did to get to Derby city in the first place. The real pain was we ended up driving past the old venue 3 times before we found the new one *sigh*. One of the locals we stopped to ask even told us that the one way system was abysmal, so it’s not just outsiders it foxes. Anyway, I’ll hire a native guide and see if I can get there. And yeah, I’ve driven through Derby multiple times now, and the stupid road system is unnavigable. At least the satnav handles it ok. If they actually bothered to signpost clearly, then it might not be so bad. I’m quite happy with the show though as I have a very broad church view of gaming and can usually find something to amuse myself with regardless of the theme (unless it’s Marlburian). I think the Derby Home Guard removed the signposts in preparation for the German invasion in 1940 and never got round to putting them back. I’ll ensure we have a satnav this year – good idea. There’s been a mix at previous shows. This is the first one I’ve been to in the last couple of years with nothing. And, there was just that snow table representing the WWII theatre (my primary historical interest), which is also disappointing. What 15mm WWII rules system(s) are you looking at? Finns are a fun army. I remember playing them in Squad Leader years ago. Some of the best troops in that game, and possessed of the only decent anti-tank rifle in the war. 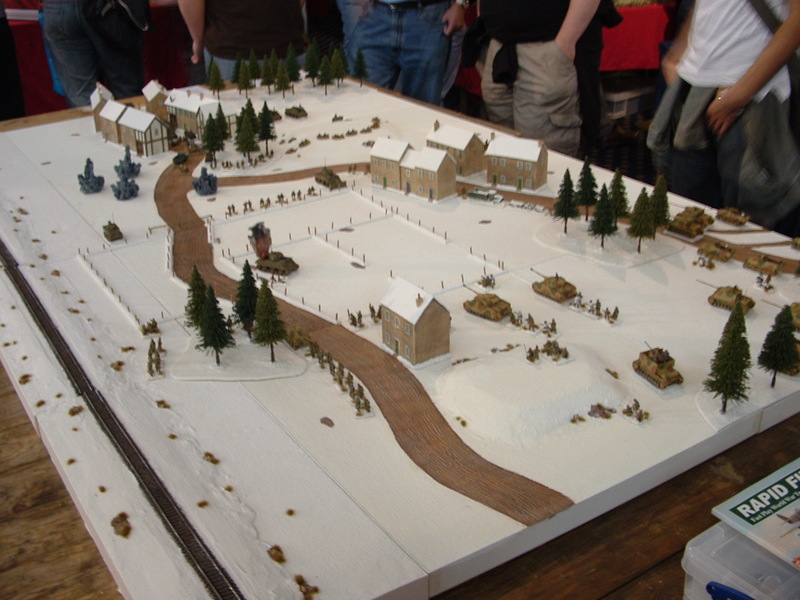 I particularly recall playing their ski troops in a deep winter scenario against the Soviets. Instead of attacking the Russian troops themselves, you skied about, chucking molotovs into the village shacks and then just left General Winter to kill them. An odd battle, but like the rest of the SL game, supposedly based on real events. It’s been so long that I went to Partizan that I can’t really remember what was there last time. Nor can I recall whether it was actually a Hammerhead I went to (rather than a Partizan per se). I also have a vague feeling that the Partizan in the spring has more of a mix. Don’t quote me on that though. 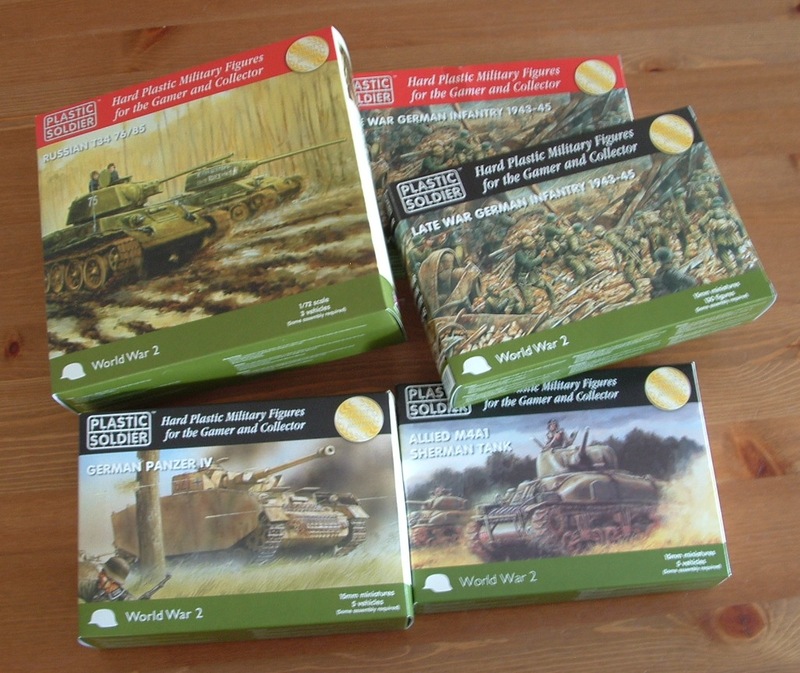 As to 15mm WWII rules, I’ve got FOW and have played it a bit, though I was going to use 10mm rather than 15 until I saw the Plastic Soldier Co stuff. Not so sure now. 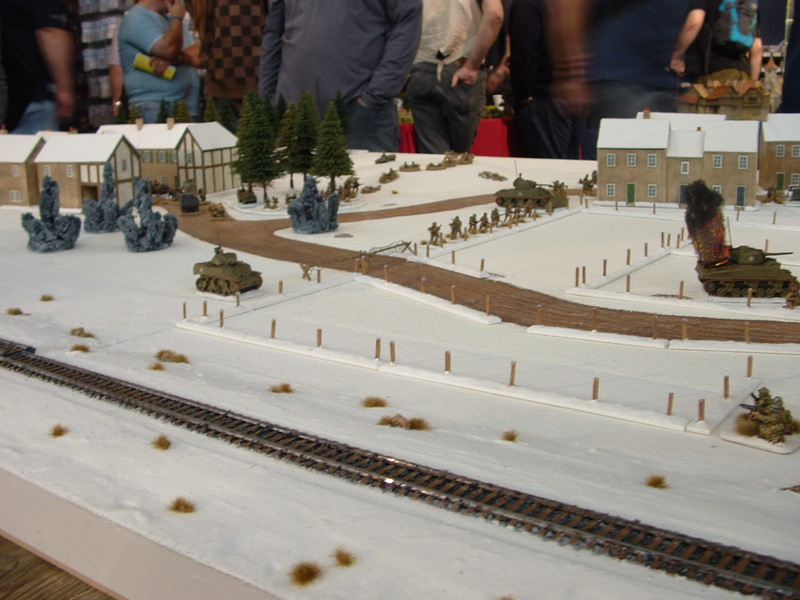 The main reason was the look of the thing on the table (15mm can look a bit cramped to me), though it could equally well be a case of people trying to put too many points on the table, which happens a lot. I’m definitely one for open space to manoeuver in rather than just cramming as many toys on as the table will support. It’s all time though, and for the next few weeks I don’t expect to have time to do much with them other than possibly a rummage in the box and a review. Oh, I’m down to two at the moment. Malifaux has taken over from both Epic and FoW. I’m half assedly in the market for a WWII rules system which I can play in 15mm. I think it was put well when someone commented that FoW comes down once too often to the roll of a single dice. You’ll lose half a platoon of Fearless models on a single low roll, and you can smash a Reluctant platoon down to a single base, but if he makes the roll, he’s still holding the bloody objective. And the difference in odds in failing a 3+ compared with making a 5+ isn’t that much. I don’t want a detailed simulation, I want a decent balance of fluid playability and gritty realism. And the moon on a stick. Ah, well you’ll search in vain for the word “detailed” in my earlier comment. What I said I wanted was something “closer to the simulation end of the spectrum”. To clarify, I do not wish to be counting hobnails on boots and bullets in clips. What I do want is a game that simulates more closely the tactical challenges and decision points a real commander might have. FOW does a clever job of combined arms and has some great features, but I do not feel as if I am presented with a credible suite of decisions. 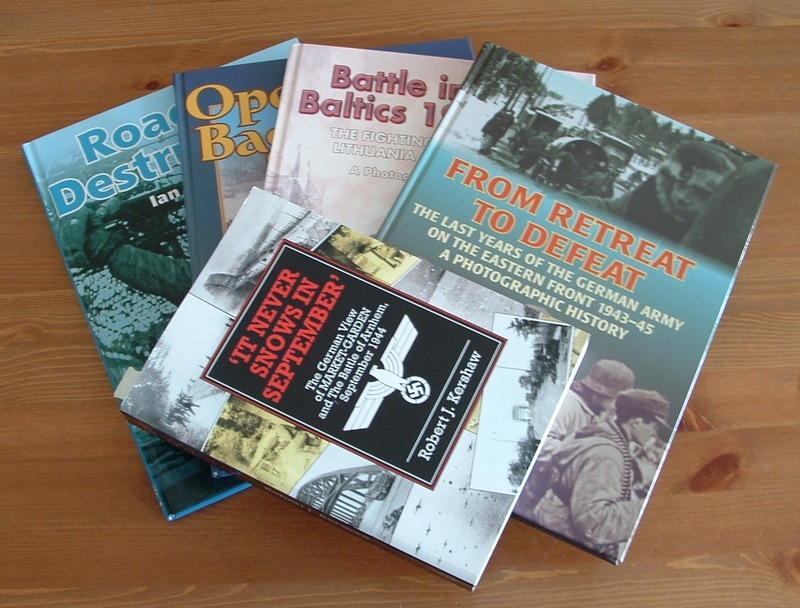 I’ve been reading the Market Garden book I got at Partizan, and as always the first hand accounts fail to gel with the gaming experience. And there’s no reason they should (more than the obvious difference of game vs reality). “A decent balance of fluid playability and gritty realism” sounds like a good starting point for a brief. I’ll leave the Moon on a stick for an expansion. On the Finns, I lack in ski troops, but have a good number of infantry platoons, a collection of captured soviet armour (KV-1s and T-28s), and only the one (or possibly two) Lahti AT rifle. Unfortunately, BF package the latter singly with the command packs. Just as well really. The Soviets have trouble coping with Finns at the best of times, and more Lahtis won’t make life any easier. Depends. In FoW, that’s only the case if the Soviets are constantly trying to overrun the Finns with armour. Bring the Strelkovy to the party, and the game shifts. The one time I’ve actually got the Finns on the table, I’ve tried to dig out a Strelkovy army from a dug-in position, and got murdered. This is true, and shading the greys is my usual approach. But, that you immediately wipe out a formation, or the whole army, on a single throw of one die, makes a very black and white outcome. Warmachine, for instance, a single dice throw is on at least two dice each time (unless things are really dire), and, unless you’ve really stacked the odds, only results at the extreme ends of the bell will have an extreme result. HOTT, you throw one die each to resolve combat, but again, it’s two dice opposing each other, so you’ve got a bell curve of probabilities, not just a black and white. True, though I was lumping dice rolls together as a set, and not worrying about whether it was 2D6 or 3D6 or whatever. You shade the greys, but the 1 in 100 chances still turn up and sometimes decide the game. It doesn’t mater how many dice you roll, if it isn’t guaranteed then it’s possibly going to upset the apple cart. That’s why I always loved the magic items in Warhammer that were a sure thing rather than a chance of something. In games as in real battles, certainties are in short supply, and being able to build plans on those is a great help. I appreciate that a 50/50 roll on a single dice that will kill a whole unit is a very dramatic moment, but again I think it’s misleading. Few players look at the compound odds of things, and that can be just as dramatic. If you have the same chance of a unit being destroyed by a rule that uses 1 dice to decide and a rule that uses 20 in four steps then you are still in the same place really, it just feels different (and one can call the second set of rules long-winded). I’m not sure if I’m saying you’re wrong or not, I think it’s just a different way of looking at things. I do know that I believe the real game to be a step beyond (under, past, wherever) the obvious and immediate dice rolls. What is the chance of unit F achieving objective 3? How many dice it takes should be immaterial to your plans. What is more important is how you can shade the greys more in your favour. To go back to the thought about one dice roll being a turning point. Crudely put, if you can expect a unit to be able to do something 1/6th of the time it should be no more irksome if this sixth ends up being the result of a single dice or a dozen. I am ignoring the possibility of there being shades of completion here: either a thing is done or it is not. The tank is burning or it’s OK. As long as the chance of it being in state A or state B is the same it matters not whether the situation is resolved with one dice or many. For example, I hit a tank with a bazooka. One set of rules says I roll a D6 and need a 6 to blow it up, otherwise it bounces off and the tank is unharmed. Another set says I roll 2D6 and if I get any double then it’s blown up, and any other result is unharmed. The odds are identical. Whether I rolled one or two dice is immaterial. Your GW example is more complex if you are rolling many models against many targets, otherwise not. if I need a 4+ to hit, a 3+ to wound and you save on a 4+, then that is the same as if I roll a single dice and inflict an unsaved wound on a 6.